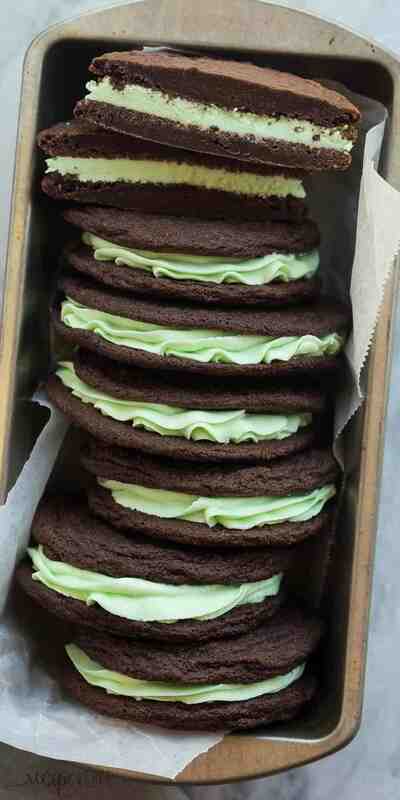 These Homemade Mint Chocolate Oreos have a homemade fudgy chocolate cookie and are filled with mint buttercream. 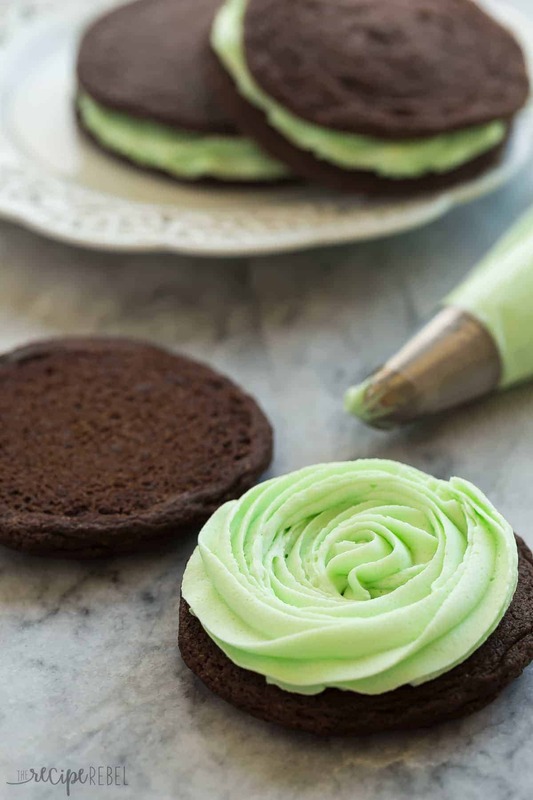 They have the perfect cookie to frosting ratio for sandwich cookies! Once again I refuse to simply choose a name for a recipe and insist on using two. I was having this big internal struggle about whether to call these “Oreos” or “sandwich cookies” and I just gave in — I couldn’t decide! 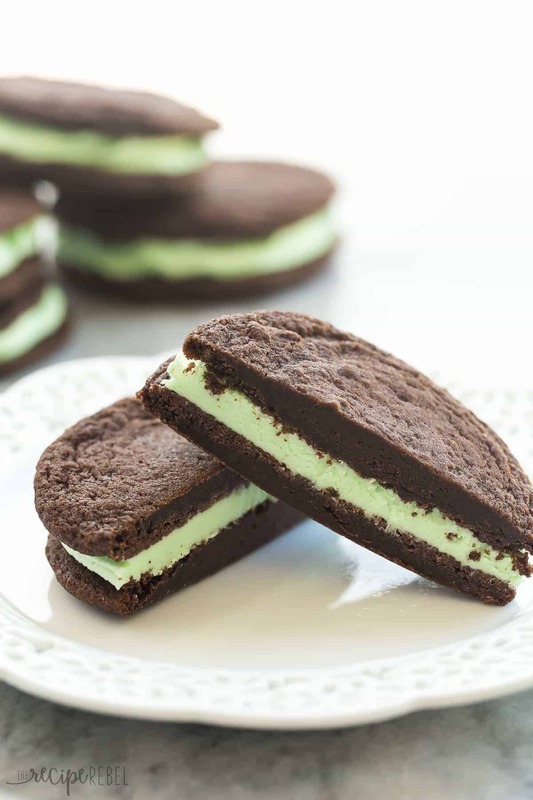 Growing up, we had homemade Oreos all the time, and they were a lot like this (minus the mint spin, of course) — they had a large, thin, chewy chocolate cookies but they were filled with cream cheese frosting. I’m pretty sure they were my favorite cookie when I was younger (I mean, I certainly wouldn’t turn a batch down today….). But I also feel like there are a lot of people who assume that when they search for “Oreo” they’re going to get cookies or other desserts made with store-bought Oreo cookies. So I wanted to make sure there was no confusion. Also, I wanted to make sure that no one was grumpy with me that the cookies aren’t those hard, gross (let’s be honest) store-bought Oreo cookies and the filling is actually luscious and creamy. Don’t get me wrong — in desperate times I have consumed my share of store-bought Oreos. But homemade is always — ALWAYS — better. Are you with me? I’ve been set on making these sandwich cookies ever since I grabbed a box from Jenna Rae Cakes nearby here. Seriously, they have the best cookies I’ve ever had. And they have the perfect cookie to frosting ratio. Their cookies are perfectly thin and chewy, so the cookie sandwiches don’t feel unreasonably large and thick. I wasn’t sure I could pull off just as perfect a cookie, but with a few tweaks to my mom’s Double Chocolate Cookies and some experimental baking, I am super happy with the result! CookiesPreheat oven to 350 degrees F and line 4 baking sheets with parchment paper (optional but recommended!). With an electric mixer, cream together butter and sugar until smooth. Add vanilla and eggs and beat until combined. Add flour, baking soda, cocoa, and salt and beat until a dough forms (it will be a bit sticky but you should still be able to roll it into balls with your hands). Roll dough into 1.5" balls (I used a 2 tablespoon cookie scoop) and place 6 on each baking sheet. Press down gently so that they're about 1cm or ½" thick. Bake for 8-9 minutes until centers are just set or only a tiny bit glossy in the center -- they will set as they cool. FrostingIn a medium bowl, beat butter until smooth. Add powdered sugar and 4 tablespoons milk and beat until smooth, adding an extra tablespoon of milk or sugar to achieve the right consistency (you want it pretty thick!). Add mint extract and green food coloring if desired and adjust to your tastes. Spread on half of your baked, cooled cookies and top with a second cookie. Store in the refrigerator for 1 week or freeze for up to 3 months. Preheat oven to 350 degrees F and line 4 baking sheets with parchment paper (optional but recommended!). Roll dough into 1.5″ balls (I used a 2 tablespoon cookie scoop) and place 6 on each baking sheet. Press down gently so that they’re about 1cm or 1/2″ thick. Bake for 8-9 minutes until centers are just set or only a tiny bit glossy in the center — they will set as they cool. In a medium bowl, beat butter until smooth. Add powdered sugar and 4 tablespoons milk and beat until smooth, adding an extra tablespoon of milk or sugar to achieve the right consistency (you want it pretty thick!). Ty for sharing this cookie recipe, I made them for my grandson and he loves them! I made half of them with regular vanilla flavored icing on the too, my daughter loves those. Now i just finished baking some more but this time I put chocolate chips on them by request of my daughter and she is so happy, this time I also topped some of them with coconut and they came out awasome! Im in love with them, again thanks for sharing they are delicious!!! I love all of those ideas! Thanks for sharing! I can’t get enough of the chocolate mint combination this time of year! These cookies look so good! Hi Ashley! I cannot remember the last time I ate a store bought cookie! Even when my kids were little I always made cookies. 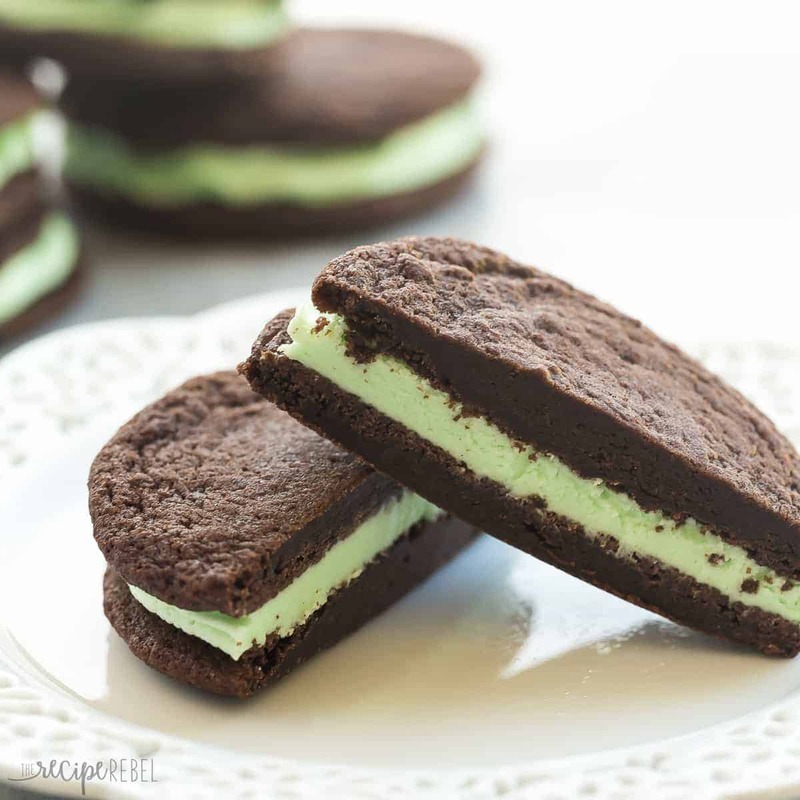 These have such a great flavor profile, I mean chocolate and mint…what’s not to love! Yes, it is definitely the best way! Thanks Dorothy! These look perfect, Ashley! Homemade totally beats the boxed kind any day! Love the mint and chocolate combo – so perfect for the holidays!